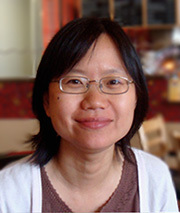 My laboratory is interested in how specialized cell types are generated during development and adult tissue homeostasis. We study this question by asking what genes are involved and how these genes are regulated in the context of the whole animals. 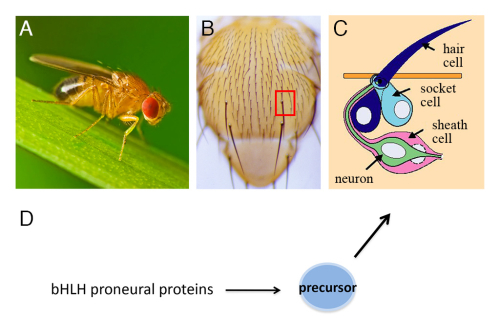 We use the Drosophila melanogaster, the fruit fly, as our model system. There are two major topics in the lab: (1) the specification and formation of sensory organ precursors (SOPs). The Drosophila external sensory (ES) organs, or called bristles, are the major mechanosensory organs on the body surface for sensing the mechanical stimulation such as wind or touch (. Each ES organ, composed of four distinct cells, is developed from a single precursor, the SOP, which is selected from neural epithelium by the action of the highly conserved proneural proteins. Our research focus is how the proneural proteins promote the SOP specification and formation. We are currently investigating the role of nuclear actin and actin-related protein in the functions of proneural proteins. The structure and the developmental process of ES organ is similar to that of the vertebrate inner ear hairs. Knowledge of the ES organ development will help us to find the mechanism in repairing and regenerating the inner ear hairs. (2) Adult stem cells are vital to maintain tissue homeostasis and organ function. After cell division, adult stem cells renew themselves and also generate daughter cells undergoing differentiation. 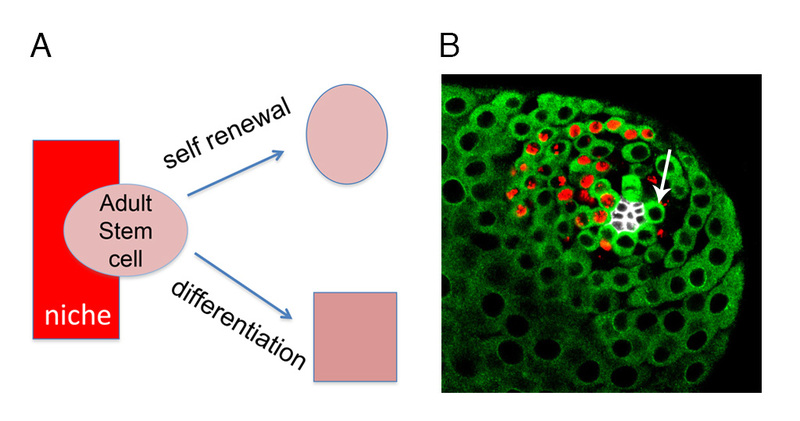 The balance between self-renew and differentiation is key to the normal functions of adult stem cells. We choose the cyst stem cells in the Drosophila testis as our model system to study the function and regulation of adult stem cells. Cyst stem cells produce cyst cells, essential for germ cell differentiation. Loss of cyst stem cells blocks germ cell differentiation and leads to male sterility. Our study identifies a novel signaling pathway for regulation of cyst stem cell self-renew. Hyperactivation of this signaling pathway leads to accumulation of cyst stem cells, and lack of differentiated cyst cells and germ cells. We are currently investigating how this pathway controls self-renewal and how its activity is regulated in the male gonad. Fig. 1. Drosophila external sensory organs. (A) Adult Drosophila. (B) The external sensory organs, or called bristles, located on the body surface. A single external sensory organ is shown in a red box. (C) Each external sensory organ is composed of four cells: hair cells, socket cells, neuron and sheath cells. (D) The bHLH proneural proteins are essential for the specification and formation of the precursor, which then develop into a single external sensory organ. Fig. 2. Adult stem cells in the Drosophila male germline. (A) The adult stem cells reside near the niche to receive the self-renewal signal. After each division, one daughter cell remains as the stem cell (self-renewal), the other daughter cell differentiates. (B) The apex of male adult testis. The niche, composed of 10-20 somatic cells, is located at the tip (white). The cells immediately surround the niche are the stem cells (indicated by arrow).